Ok, so I know in my most recent post about Oma Frieda's Grießklößchen mit Kirschen, I was reproachfully telling you all that German food is more than just Bavaria, that the regions in Germany itself are wonderfully diverse, und so weiter und so fort... but that doesn't mean I don't occasionally love to indulge a good bit of generously-portioned, Heino-singing, Bier-drinking, Lederhosen-wearing, Bavarian fun. So here we are, PORKTOBERFEST III. As you'll see, the menu we decided on is my standard "I've invited people over and they expect crackling!" menu! (You will have seen this previously in PORKTOBERFEST I, PORKTOBERFEST II, PORKDATE, Dinner for Kate & Rob, and Slow-Roasted Shoulder of Pork). When I went shopping for the ingredients, I stumbled across the Junction Deli in Camberwell Market, and I was thrilled to find that they stock heaps of German goodies! 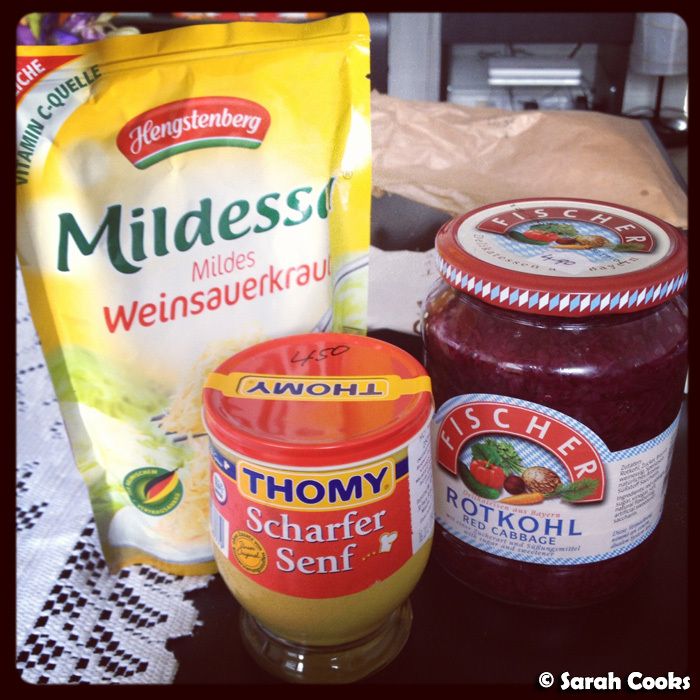 Apart from jars and packets of sauerkraut (the same brand that Sandra's mum sends us from Germany! 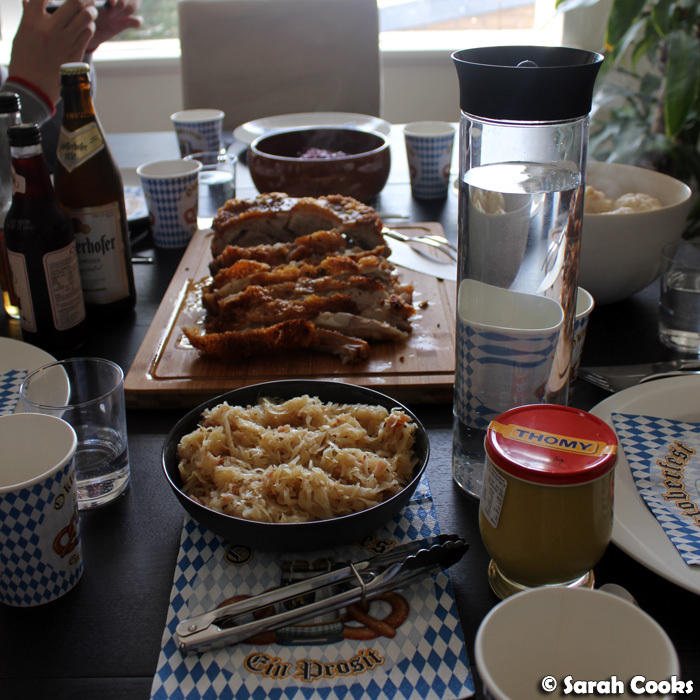 ), red cabbage and Thomy mustard, they had a great range of German coldcuts, like Schulz bacon and Jaegerbraten (from the Barossa! 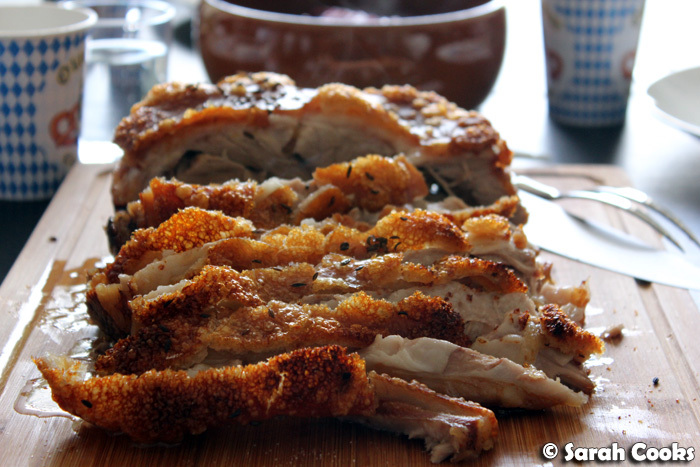 ), leberkaese and more. Who knew! 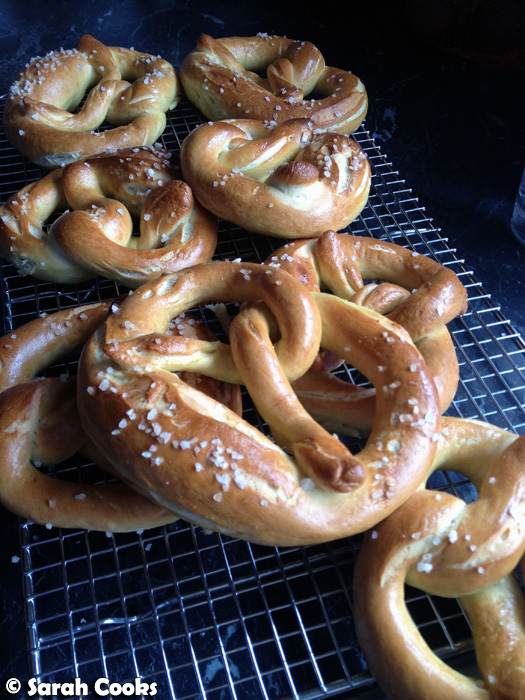 I baked fresh pretzels as a starter (well, basically to dent people's hunger until the pork was ready!). 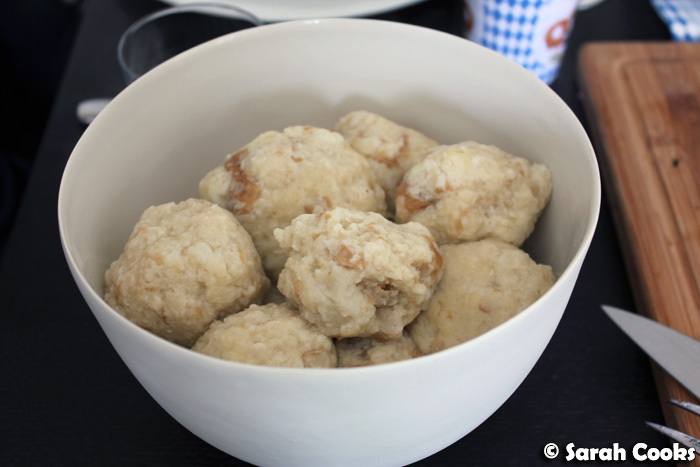 I've recently realised I can't call these Laugenbrezeln as I don't use the traditional lye solution to poach the pretzels before baking, but rather the more home-friendly baking soda. Either way, I'm always pleased with the results! (See my previous post on pretzels here). 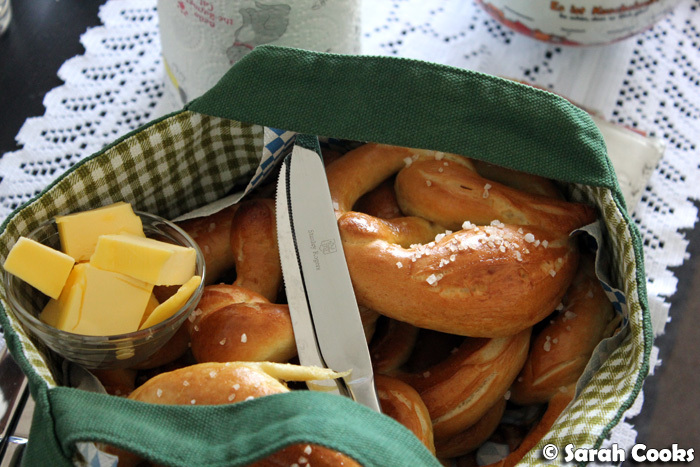 And here they are in their pretzel-specific receptacle! I love this little green bag so very much. And here's the lunch! Guten Appetit! 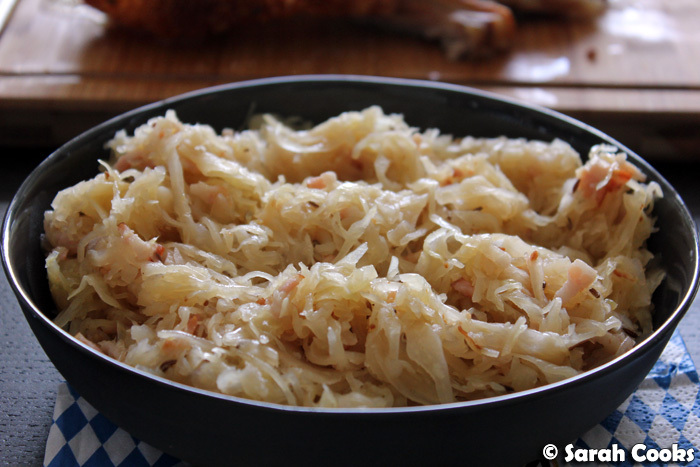 To accompany, I made sauerkraut, enhanced with a little onion, speck and the obligatory caraway seeds. There was also red cabbage, and traditional bread dumplings. The dumplings' squidgy soft fluffiness is the perfect foil for rich roast meats. I know I've written about bread dumplings and red cabbage a lot - as they are now my standard accompaniment for big meals like this - but I've never actually posted the recipes up. If anyone is interested, let me know and I'll happily put them up on my blog! Dessert was a simplified version of one of my favourite cakes: Black Forest Cake / Schwarzwälder Kirschtorte. 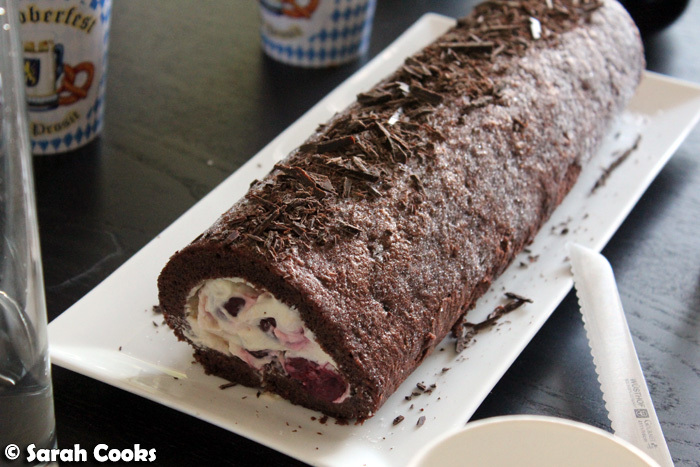 (See my Schwarzwälder Kirschtorte post for a step-by-step guide on making the traditional one!) I made a light chocolate sponge - I used a Jamie Oliver recipe for the cake but found the result a bit tough, so I wouldn't suggest using it - if you do make this yourself, try looking for a recipe for a chocolate swiss roll or a Bûche de Noël. For the filling, (which I just winged), I whipped some cream, spiked it with kirsch and sweetened it with castor sugar. I then folded through some jarred sour cherries, spread it on the cake base and rolled it up! Drizzle over extra kirsch and top with extra chocolate flakes over for even more deliciouness! 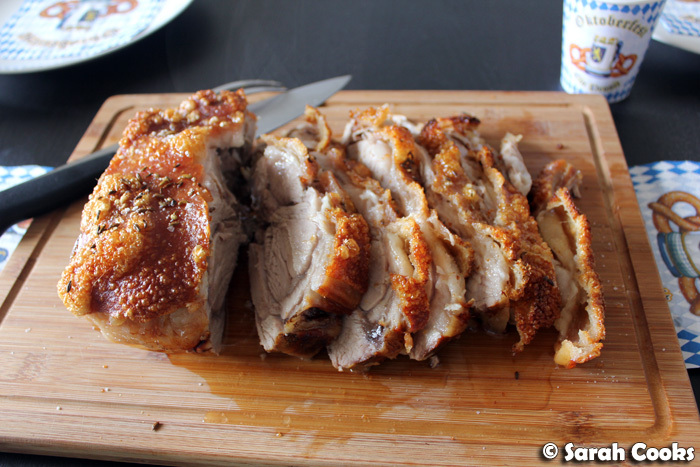 Sarah this pork has me seriously drooling - look at that crackling - amazing.